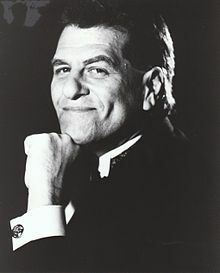 Len Barry (born Leonard Borisoff on June 12, 1942 in West Philadelphia, Pennsylvania, United States) is an American vocalist, songwriter, and record producer. Born and raised in Philadelphia, Barry had little thought of a show business career while still in school. Instead, he aspired to become a professional basketball player upon his graduation. It was not until he entered military service and had occasion to sing with the US Coast Guard band at Cape May, New Jersey, and was so encouraged by the response of his military audiences, that he decided to make music a career. Upon his discharge from military service, Barry returned home to Philadelphia and formed the Dovells, he was their lead singer. His is the lead voice on all their best selling records "Bristol Stomp", "Hully Gully Baby", and "You Can't Sit Down", among others. "Bristol Stomp" sold over one million copies, and was awarded a RIAA gold disc. As a Dovell, he also toured with James Brown. Barry also made film appearances with the Dovells in films such as Don't Knock the Twist, toured the UK with the Motown Revue. Barry also had guest appearances on US television on "Bandstand" and later American Bandstand, Shindig, and Hullabaloo. Soon after leaving the group, Barry recorded his first solo single "Lip Sync". As someone who sang rhythm and blues, he recorded hits in 1965 and 1966 for Decca Records in the US and released by Brunswick Records: "1-2-3", "Like a Baby", and "I Struck It Rich", a song he wrote with Leon Huff of the Philadelphia International Records producers, Gamble and Huff. His first two hits also made the Top Ten of the UK Singles Chart. "1-2-3" reached number three. Those songs also peaked at number 2 and 27 on the US Billboard Hot 100 chart respectively. "1-2-3" sold over four million copies, and gave Barry his second RIAA gold disc and a Grammy Award nomination for Contemporary Rock & Roll Male Vocal Performance. Both "1-2-3" and "Like a Baby" were composed by Barry, John Madara, and David White (musician). He has performed at the Apollo Theatre in New York; the Howard Theatre in Washington, D.C.; The Regal Chicago, Chicago; Illinois; The Fox Theatre (Detroit) in Detroit, Michigan; and The Uptown (Philadelphia), Philadelphia, Pennsylvania. He also toured with Sam Cooke, The Motown Revue in the United Kingdom, and appeared on Top of the Pops. He became a major singing star in The United Kingdom. Highlights of his European tour included featured performances at the London Palladium and Royal Albert Hall as well as numerous appearances throughout England, Ireland, Scotland and Wales. Barry's respect of the Native American culture led him to write and produce the instrumental "Keem-O-Sabe". The song went to number 16 on the Billboard Hot 100 in 1969 for The Electric Indian. He also did writing and production work with WMOT Productions. With Bobby Eli he helped write the hit singles "Zoom" for Fat Larry's Band, and "Love Town" for Booker Newberry III. In May 2008, Barry reinvented himself as an author with the publication of novel, Black-Like-Me. The storyline involved a pair of Caucasian siblings growing up in a largely African-American neighborhood, accepted by some, rejected by others. In 2011, Barry was featured in the PBS Series My Music: Rock, Pop & Doo Wop. "It's That Time Of Year Again"
1967 "The Moving Finger Writes"
1969 "Put Out The Fire"
1970 "Bob and Carol and Ted and Alice"
^ "Today in history". ABC News. Associated Press. June 12, 2014. ^ Len Barry at AllMusic. Retrieved September 12, 2017. ^ a b "Len Barry". Internet Movie Database. Retrieved January 27, 2014. ^ a b c Murrells, Joseph (1978). The Book of Golden Discs (2nd ed.). London: Barrie and Jenkins Ltd. p. 134 & 186. ISBN 0-214-20512-6. ^ a b Roberts, David (2006). British Hit Singles & Albums (19th ed.). London: Guinness World Records Limited. p. 43. ISBN 1-904994-10-5. ^ "Len Barry's Bio Page". Lenbarry.com. Retrieved January 26, 2014. ^ Joel Whitburn (2004). The Billboard Book of Top 40 Hits (8th ed.). Billboard Books. ISBN 9780823074990. ^ "Zoom - Fat Larry's Band | Listen, Appearances, Song Review". AllMusic. Retrieved January 26, 2014. ^ "Love Town - Booker Newberry III | Listen, Appearances, Song Review". AllMusic. Retrieved January 26, 2014. ^ "BLACK-LIKE-ME: Len Barry, Spencer Barry: 9781904408345: Amazon.com: Books". Amazon.com. May 2, 2008. Retrieved January 26, 2014. ^ "Len Barry Latest Albums | MTV". VH1. Retrieved January 26, 2014.